tango, originally uploaded by jahansell. Last night's Project Troubador might have been my favorite ever. It got off to a slow start- it was raining lightly for the first few hours, and the audience didn't really start to fill up until halfway through. Too bad for the latecomers - they missed the always wonderful Joint Chiefs (but will have more chances this summer at the Millerton Farmers Market) and an Argentian singer names Sofia Tosello. But by the time the tango dancing started, the crowd was filling out, and at least 30 or 40 of us got a tango lesson too. Finally, Red Baraat, a "dhol 'n' brass" band melding Indian Bhangra with jazz and funk, was absolutely fantastic. 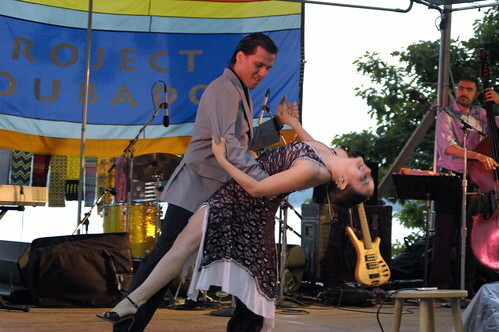 Tango dancers can be fun to watch. Glad to hear the Grove filled out eventually. Part of the reason for the light crowd could have been the fundraiser at Music Mountain for Robinhood Radio and I know of at least two big private parties in Salisbury that same evening.